Nina Willis, a Toronto tenant who has been evicted from at least seven homes since 2005 for not paying rent, was found guilty after an eight-day trial that turned into a spectacle. 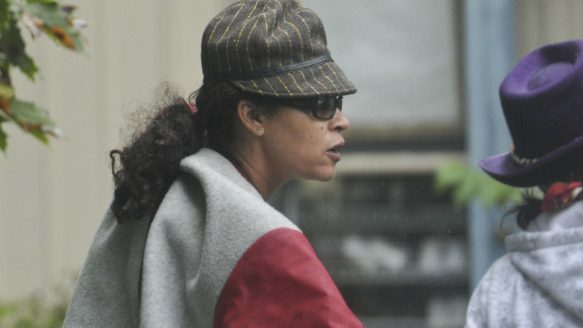 Nina Willis arrives to remove her possessions from the home of Darius Vakili in September 2012, following an eviction order. Willis was recently convicted of defrauding Vakili and another former landlord. A Toronto tenant who used publicly funded systems to stall evictions, causing serious financial harm to a string of landlords in the process, has been convicted of fraud. Justice Alphonse Lacavera found Nina Willis, 50, guilty of defrauding two former landlords, or lying during the rental application process. The Star earlier investigated the Willis case and others which revealed problems in the landlord-tenant system in Ontario. The Star sat in on the criminal proceedings as part of its ongoing investigation into how some renters abuse protections at the tenant board to stall evictions and how privacy legislation keeps their histories, as well as those of abusive landlords, secret. Willis has been ordered out of at least seven properties since 2005. The Willis trial, which lasted eight days, was a spectacle. Files were dropped on tables, she fired her lawyer, conspiracy theories were introduced and Willis attempted to plead “the fifth” — prompting assistant crown attorney Craig Power to point out that tactic was most commonly employed in American television. A tape recorder, court heard, was allegedly used by Willis to record a conversation between prosecutor Power and a witness outside of court. There was also a connection to the star of the film Titanic, though the A-list celebrity was not named in court. Crown attorney Power described Willis as a “seasoned and practiced liar” who treated landlords as “prey” and who had tried to stall her criminal trial. “This is not her first time at the rodeo,” he told court. Willis, in her testimony, said she didn’t set out to cheat her former landlords, alleged collusion and abuse, and repeatedly apologized to and thanked the judge for listening. “The crown says I looked for victims. No, I looked to secure a place for the full amount of rent,” she said. Justice Lacavera noted that Willis may have been the “author of her own misfortunes because of her proclivity to complain” about apartment maintenance — a reason she often gives landlords for withholding rent — and could have faced hardships in the past. But, as he repeated throughout the trial, her rental history, tales of woe, denials, admission, apologies or compliments would not impact his decision. The judge found her guilty of two counts of fraud under $5,000 and two counts of false pretense under $5,000. She is scheduled to be sentenced on March 19. Former landlords Virginia Stoymenoff and Darius Vakili testified that on application forms and in emails Willis gave them false references and phone numbers, lied about where she worked and lived, and that she never intended to pay full rent. She also, court heard, left a threatening note on the windshield of landlord Stoymenoff’s grandson’s car. Stoymenoff told court that Willis had claimed to work for event management company Marcus Evans and listed her sister as her boss. Willis, when she gave her side of that story, said she signed a blank rental form and Stoymenoff filled it out. She later acknowledged she fabricated some rental information, because she didn’t know it was against the law. Willis moved into that house in 2010. Stoymenoff took Willis to the tenant board in early 2011, because she had stopped paying rent. At that hearing Willis complained the house was in disrepair, with one room covered in mould. Her landlord said the room, a cold storage room, was not part of the rental agreement and Willis had to break through a sealed door to get inside. In court, Willis explained she needed the room to store the belongings of her sister, Aretha Wilson, after she suddenly had to leave for the U.S.
Media coverage in the Star and other newspapers, which the investigating officer was aware of, noted that Wilson was extradited to the U.S. around that time to face assault charges for smashing a drinking glass or bottle into the face of Leonardo DiCaprio during a 2005 party in the Hollywood Hills. The actor reportedly needed 17 stitches. Wilson, who had consented to the extradition, pleaded guilty in a U.S. court and was sentenced to two years in prison, according to the Vancouver Sun. She did not respond to a message left at her Toronto workplace. At Nina Willis’ trial in late December, the witness list also included a third landlord (who Willis claimed she had a long and happy relationship with) an ex-employee from Public Mobile (where Willis told Vakili she worked), a payroll finance manager for Marcus Evans (where Willis said she worked as a transcriber) and a condominium property manager (where Willis claimed her husband worked). Their evidence contradicted Willis’s claims. Halfway through Willis testimony she fired her lawyer, Jacqueline An. The sacking, court heard, took place in a hallway during a morning break. Willis denied it and alleged abuse. An was allowed to leave. Justice Lacavera said he was sympathetic to An’s position, but denied the request to keep the trial on track. He then ordered Willis, who was whispering in An’s ear, to move to the gallery and use a pencil and paper to take notes she could share with An during breaks. “You must let her do her job,” the justice said. An tried to do so until she was fired. When Willis rents your home she seems charming and responsible, according to former landlords, but then the rent payments stop. At the tenant board she typically alleges harassment and discrimination and when ordered out appeals, putting the eviction on hold. She has lost her last seven appeals. Landlord Vakili testified that Willis said she worked for Public Mobile when renting his Don Mills home in summer 2011, but cheques started bouncing shortly after she moved in. It took the better part of a year to get her out, and involved multiple board appearances and appeals court, and ended with the Sherriff. The house was left dirty and filled with piles of trash. A civil court judge ordered her to pay $6,500 in damages, in a judgment dated October 31. She also changed the locks, resulting in convictions through the Ministry of Municipal Affairs and Housing. Assistant crown attorney Power pledged to seek the maximum penalty and requested Lacavera order a presentencing report. Willis, who said she is Ojibwa and her mother a chief, asked for a Gladuea report, a document that details how social or cultural challenges tied to a person’s Aboriginal heritage should factor into sentencing. During the trial she suggested that not wanting to live in conditions similar to those on First Nations reserves is why she complains about repairs, then said she wanted the report so she could avoid jail time. After she was found guilty Willis praised Lacavera for his public service.